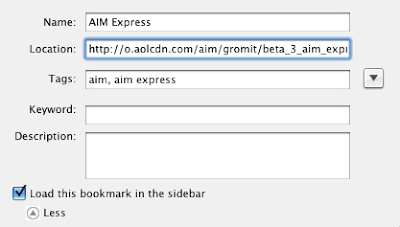 Firefox only: By default, AIM Express runs in a new browser window. 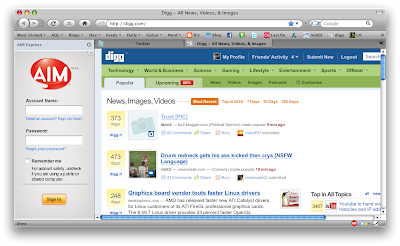 I prefer to run AIM Express on my Firefox sidebar, and so I thought I'd share how to do that! Then add this as a bookmark, make sure to check "Load this bookmark in the sidebar"
i did the same thing! i had yoono for about a week but it had some extras i didn't need, so i tried this and now its just like having AIM integration, without the meebo sidebar junk and without all the email, feeds and other yoono goods. unfortunatley for you though, i learned this on my own not from ur blog lol.